Macy’s department store in New York City has hosted a holiday parade annually since 1924, and in 1927 began appealing more to children by introducing enormous balloons in the shape of well-known characters. (The first: Felix The Cat.) Each year, new balloons are added, sometimes because the characters they represent have become so popular (like 2010 rookie, the Wimpy Kid) and sometimes for more cynical reasons. Over the years, some have become staples—like Kermit The Frog, Snoopy, and Bullwinkle—while others couldn’t be deflated fast enough. 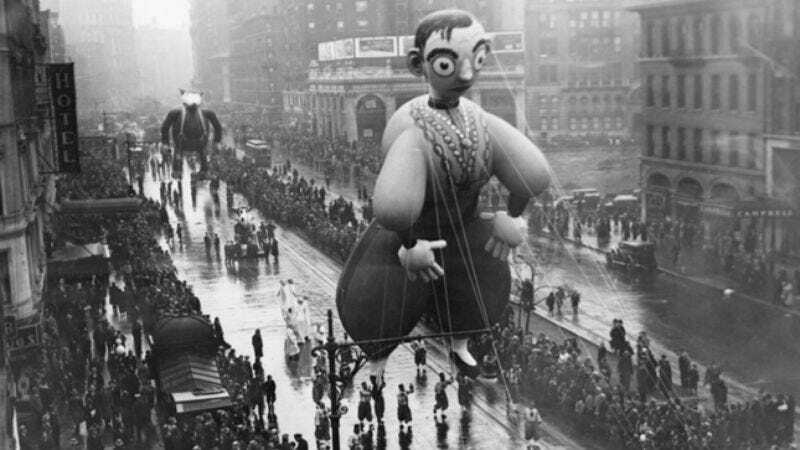 For example, the 1940 parade featured a balloon in the likeness of Eddie Cantor, the banjo-eyed song-and-dance man whose peak years of popularity were already behind him before he floated down Broadway. Why don’t we still see Cantor in the parade today? For one, the organizers have shied away from using balloons based on real people. For another… well, these balloons are meant to give kids something to enjoy between the floats, bands, and lip-synched performances from Broadway hits. The ghoulish visage of Eddie Cantor doesn’t exactly fill young people’s hearts with joy. In 1917, James Montgomery Flagg produced a recruiting poster for the U.S. Army, featuring the iconic image of a top-hatted, blue-coated, white-bearded Uncle Sam pointing at the viewer over text that reads, “I Want You.” In 1938, Uncle Sam joined the Macy’s balloon army, hovering above the fray with his hands by his sides. This Uncle Sam—a differently designed Sam has reappeared in recent years—made no specific demands of the children, beyond that they look up to him as the American patriotic ideal. And perhaps admire his super-stripy pants. When four balloons representing the Marx brothers marched through the 2003 Macy’s parade, spectators may have been a little baffled. The Marx balloons were part of an attempt to celebrate the parade’s past by copying vintage designs from back when the Thanksgiving streets were filled with more than just cartoon characters and advertising mascots. They weren’t traditional balloons, but rather floats with giant balloon heads meant to resemble the brothers. The giant-headed brothers, decked out in black and white, had been a mainstay of the parade in the ’30s, but in the 21st century they came off as garish, bizarre, and vaguely horrific. They haven’t reappeared. Despite appearing as the mascot for a cereal that flopped—Crispy Critters—and starring in a TV cartoon series that was canceled in 1969 after the FCC ruled that advertising mascots couldn’t stars in kids’ TV shows, Linus The Lionhearted continued to appear at the parade until 1991, well after the character had lost his relevance to the modern public. (One of the other stars of his show, Sugar Bear, lived on well after the cancellation as the mascot of Super Golden Crisp.) Post Cereals tried to revive Crispy Critters in the ’80s, but the cereal was never popular, perhaps because its name had already entered the vernacular as a slang term for corpses burned in fires. The ’60s were boom times for American oil companies, with the relationship between corporations and consumers much warmer than in our era of spills and price-gouging. Some companies maintained a friendly presence in the marketplace via adorable mascots. These included Sinclair, whose dinosaur helpfully reminded consumers that their cars and homes were powered by the long-dead remains of the giant beasts that had once roamed the earth. The Sinclair oil dinosaur became a Macy’s balloon in 1963 and lasted until the ’70s, when the oil bust made the character less lovable and more chillingly symbolic. Unless you count Elsie The Cow (and who would? ), Olive Oyl was the first female character to get a balloon all to herself, debuting in the early ’80s and then sticking around for much of the decade before finally retiring after losing her left arm in an accident in the 1986 parade. (She had to sit out the 1985 parade after an accident, too.) Popeye and his pals have been a frequent presence at the parade throughout its history, but balloons of the characters have a spotty record, and the Olive Oyl balloon, which was several stories tall and stood straight up, was too flimsy to endure even the mildest weather. Thanks to both poor design and the characters’ waning popularity, she was sacked. So much for women's lib. Author P.G. Wodehouse created the character of Jeeves, the unflappable valet, in the 1915 short story “Extricating Young Gussie” and then used him again in 34 more short stories and 11 novels, all of which left such an impression on popular culture that the name “Jeeves” has become shorthand for “manservant.” So it’s only fair that the fastidious, conscientious Jeeves would get to take his turn in the sky alongside all the Disney characters and comic book heroes. But the way Jeeves made his Macy’s debut was a little sad: It was in the year 2000 as the mascot for the search engine Ask.com, then known as “AskJeeves.” (The concept of the site was that it would serve as a butler-like assistant to the user, finding the answers to common and uncommon questions.) Later, Ask.com phased out the Jeeves character in some markets, making Jeeves’ brief stint as a corporate spokesballoon all the more undignified. Every little girl wanted a Sky Dancer in the mid-’90s, even though the toys—which whirled off into the air, then came spinning back down to earth—were responsible for more than 100 reported injuries. Unsafe or not, the Dancers cracked the Macy’s Thanksgiving Day ranks at a time when it seemed like pretty much anyone could get a balloon. What, no Lawn Darts? The parade has a rich history of balloons from briefly popular kids’ movies turning up to promote the sequels. The balloon for Babe the pig heralded the release of Babe: Pig In The City then was almost never seen again, and the balloon for Beethoven the dog arrived in 1993 for the release of Beethoven’s 2nd, then appeared in just a few more parades before resurfacing in 2008 (long after the character had lost all pop-cultural relevance) due to an impending direct-to-DVD sequel. Will Beethoven keep coming back from the grave, the Macy’s equivalent of Count St. Germain, doomed to roam the earth until the studio stops cashing in on a vaguely familiar property? In the mid-’80s, killer whale fever briefly gripped the American populace, as the orcas in captivity in this country’s many SeaWorlds (including one in Ohio, weirdly) gave birth to baby whales. In order to promote this momentous occasion, SeaWorld commissioned a Baby Shamu balloon, which resembled the jovial cartoon character of the company’s merchandising, not the sad-eyed little sea creature who would never know the freedom of the open water. As time marched on, Baby Shamu grew up into an actual Shamu, and the park’s treatment of its captive creatures came under increased scrutiny, particularly from the hard-hitting Free Willy series. If SeaWorld had any dreams of reviving the balloon, the recent whale attack at one of its parks probably shelved those permanently. When Atlanta was announced as the host for the 1996 Summer Olympics, controversy ensued as critics blasted the Olympic committee for bypassing Athens, Greece (on the 100th anniversary of the modern games, no less) and for possible corruption. Atlanta didn’t help its case when it unveiled the games’ mascot: Izzy, a blue blob introduced as a sports-loving member of the Whatizit species, featuring tapered extremities and a grin to rival native Georgian Jimmy Carter’s. Izzy got his day in the sky, showing up in the 1995 parade carrying the Olympic torch—another example of marketers using the parade to make the character, not vice-versa. It’s hard to get too up in arms about the commercialization of a parade mounted by a department store chain, but there has been a disturbing influx of corporate mascot balloons over the past decade, floating down the street for a year or two to tout some product often not even aimed at children. At least Cheesasaurus Rex was a character created by Kraft to sell its macaroni and cheese dinners to kids (a demographic not ordinarily resistant to the product, but whatever). Still, there’s something a little untoward about Kraft concocting a cheese-loving, orange-colored dinosaur and then presuming he’s a beloved character on the level of Underdog. Are we supposed to think it’s cute that the balloon version of the dinosaur carries a camera, playing tourist? Are we meant to nod and say, “That’s just so Cheesasaurus Rex!”?